This was worked on several times, because there were some beautiful patterns and lines there, not only in the tile, but also in the concrete fountain edges, which have an art deco feel to their angles. The mosses and algae changed each time I returned, and were especially intriguing. Birds and people came and went, as I sat there. 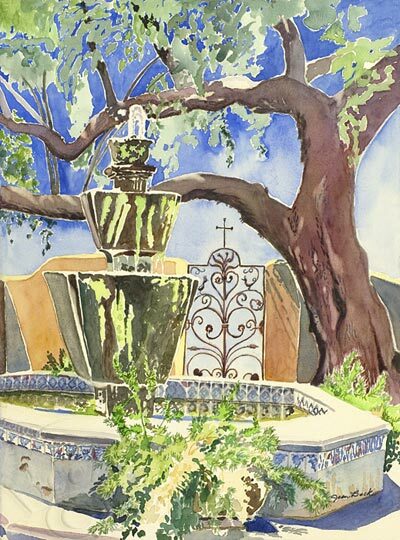 Juried into the SAWG Signature show by Raleigh Kinney, this painting was also juried into the Images of St. Philip's show by Vicki Donkersley, where she gave it an honorable mention.